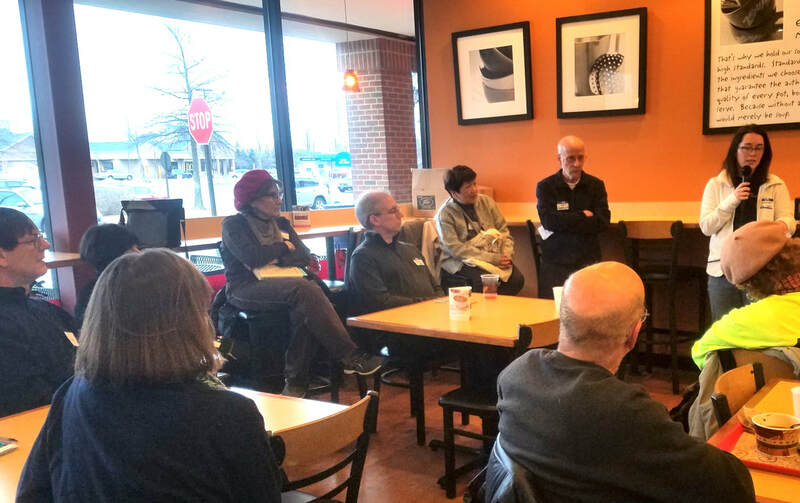 Thanks to all neighbors who attended the 6th annual Community Forum at Zoup!. Thanks to Zoup! for hosting the forum. Brian Steglitz, Manager of Water Treatment Services gave a presentation on the water treatment process that Ann Arbor uses, current issues, and future plans for the water treatment facility. He also answered many questions from the audience. 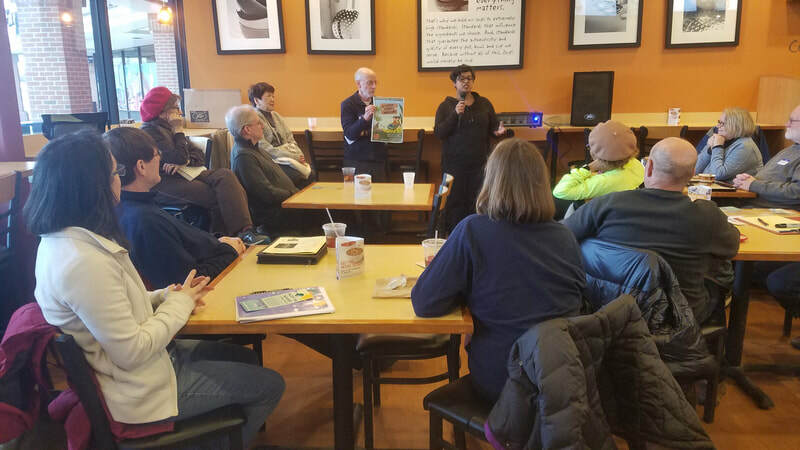 The meeting was moved to Sweetwaters since Clague Middle School was closed due to inclement weather. Thanks to Brian and all the neighbors who attended this informative meeting. cider, apples, and donuts for all courtesy of OHMHA. a Wildlife Demonstration presented by Francie Krawke of Michigan Avian Experience. Musical Entertainment highlighted by the Thurston Elementary School choirs. Activities, games, and presentations/literature from local neighborhood organizations. Thanks to all who attended the Candidates Forum sponsored by OHMHA at the Ann Arbor District Library Traverwood Branch. The forum featured the Ward 2 City Council candidates as well as the mayoral candidates. Thanks to all who participated in the annual meeting held at the OHAC pool. 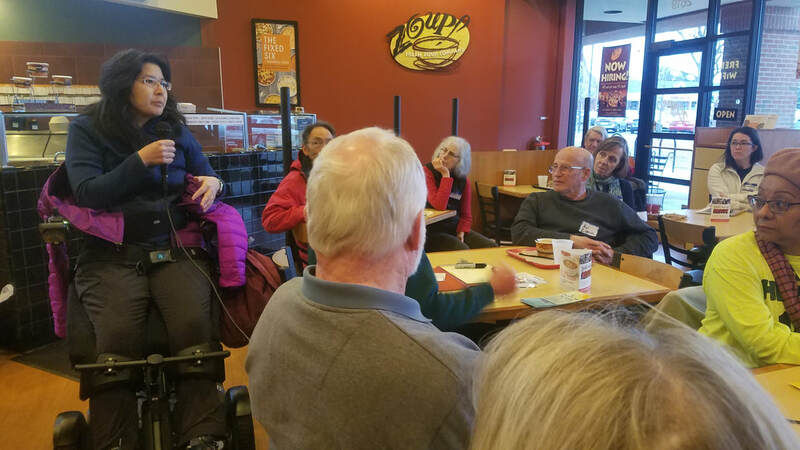 Josie Parker, Director of the Ann Arbor District Library, gave an informative presentation and answered a wide range of questions from the audience. Thanks and congratulations to new OHMHA board members Dave Hibbs and Debbie Torch. 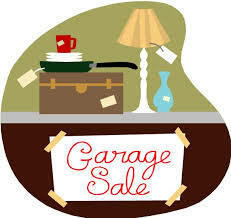 Thanks to all buyers and sellers for helping to make the OHMHA Garage Sales a success on a very rainy Saturday! • Cider, donuts, brownies and apples courtesy of OHMHA. • Our favorite eagle, hawk, and owl in a Wildlife Demonstration presented by Francie Krawke of Michigan Avian Experience. well as the Thurston Elementary School choirs. • Local school charities fundraising - including the Kiwanis Thurston 5K Run Walk and Family 1 Mile Fun Run. • Many more activities, games, and presentations/literature from local neighborhood organizations. Groups represented were OHMHA, OHAC, Bromley, Kiwanis, Thurston PTO, AADL, Community Action Network (CAN), and Nixon Area Alliance. Great stage events including: Mike Conboy appreciation from TNC and CAN, Community High Jazz Band, Thurston 3rd, 4th and 5th grade choirs, Audubon Russet, and Sarah of Michigan Avian Experience with Birds of Prey. Free cider, apple, doughnuts, a raffle and the M&M's guessing game, face painting and a pizza sale fundraiser for Thurston Pantry. No less than three members of the Ann Arbor Police Department attended. City Council Member Jane Lumm and County Commissioner Yousef Rahbi also attended. You can now pay your OHMHA annual dues online. Dues are $20 -- additional contributions are gratefully accepted. Click the button below to pay with PayPal. Note: Please check the box on the PayPal screen that allows PayPal to share your address with us! Jerry Schulte with a street address so that we can make sure that we include them in this initiative.